The 2012 Nissan 370Z is also available in two hardtop models: the 370Z Coupe and the NISMO 370Z. For information on those vehicles, please see NissanNews.com. Standard interior comfort and convenience features include Nissan Intelligent Key® with Push Button Ignition, power windows with one-touch auto up/down feature, power door locks with auto-lock feature and a center console box with a non-intrusive cover design. Other features include automatic climate control, two 12-volt power outlets, three cupholders (two in door panels, one in center console) and an AM/FM/CD/AUX 4-speaker audio system with illuminated steering wheel-mounted controls. The Touring model adds a 6CD Bose audio system with eight speakers (includes dual subwoofer) and MP3/WMA playback, XM® Satellite Radio (XM® subscription required, sold separately), Bluetooth® Hands-free Phone System, HomeLink® Universal Transceiver and aluminum-trimmed pedals. The 2012 Nissan 370Z Roadster interior is available in Black cloth or for 370Z Touring Roadster models, a choice of Gray, Black or Wine leather-appointed A/C and heated ventilated seats. This not only allows the driver to focus more on braking and steering, it improves the smoothness of gear shifts by reducing the typical “shock” when the clutch is engaged. The system can be deactivated with a button next to the shifter for drivers who prefer to shift on their own. 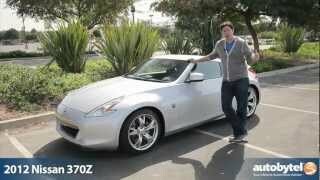 Estimated fuel economy for the 2012 370Z Roadster is 18 mpg City/25 mpg Highway for both the 7-speed automatic and 6-speed manual transmissions. The Z® Roadster also utilizes the Z Coupe’s advanced 4-wheel independent suspension. The double-wishbone front suspension uses lightweight forged aluminum arms and a lightweight rigid aluminum-alloy cradle, along with a hollow construction stabilizer bar. The 4-link rear suspension integrates the rear cradle into a single part. “High response” shock absorbers are utilized on each corner for enhanced ride comfort.